You could say Bianca Andreescu was red-lining her game when she defeated Angelique Kerber 6-4, 3-6, 6-4 to win the BNP Paribas Open in Indian Wells, California, on Sunday. While she may have upped her intensity and her level against the three-time Grand Slam champion, her victory was essentially an extension of the inspired tennis she had played the entire tournament. And though much has been made of the variety in her game, it was her power – superior to every one of her seven opponents – that carried the 18-year-old to the greatest title ever won by a Canadian woman. Her grit was also off the charts. Whenever she seemed on the ropes on Sunday against the reigning Wimbledon champion, she immediately punched back with fearless, attacking shot-making. Despite being dispirited and saying her feet were “burning”, what did she do? She proceeded to win the first point played with a forehand winner, the third point with a glorious backhand lob winner and the fourth point with a forehand volley winner on her way to breaking back to three-all. But that was not the end of “adversity.” While she won three games in a row to lead 5-3, she then endured the disappointment of failing to convert three match points in the following game. Kerber, seemingly reinvigorated, was now serving to level the set at 5-5. So what did a battle-weary Andreescu, who had a medical time-out after the third game for an arm/shoulder issue and then changeover treatment at 5-4 for a leg problem, proceed to go out and do? She started the final game with a forehand winner and three points later at 30-all, she launched a huge forehand inside/out winner that a deflated Kerber could only watch scorch through the open court. On the final point, the German, facing a fourth match point, misfired with a backhand into the net and Andreescu had won one the most memorable victories for a teenager in decades. It was also her first WTA title because her win at a $125K event in Newport Beach, California, in January doesn’t qualify as main tour. The final winners score was 44-16 for the Mississauga, Ont., native. Andreescu lay flat on the court after the moment of victory, overwhelmed by a win that in the first 11 weeks of 2019 has helped boost her WTA ranking from No. 178 all the way up to No. 24. She also jumped to No. 5 in the ‘Race to Shenzhen (China)’ for one of the eight spots in the year-end WTA Finals. In Indian Wells she outplayed and outhit No. 20-ranked Garbine Muguruza in the quarter-finals, No. 6 Elina Svitolina in the semi-finals and No. 8 Kerber in the final. The BNP Paribas Open is a WTA Premier Mandatory tournament, meaning it’s one of four elite events on the WTA tour outside the Grand Slams – and probably its most prestigious. Her victory is record-setting for women’s tennis in Canada. In terms of capturing the imagination of the nation, it rates with Genie Bouchard reaching the 2014 Wimbledon final and Carling Bassett making it to the final of the 1983 WTA event in Amelia Island, Florida, at 15 years old. There she led 4-2 in the final set before losing 6-3, 2-6, 7-5 to the great Chris Evert, 28 years old and in her prime at the time. Aleksandra Wozniak won the WTA event in Stanford (Berkeley, California) in 2008 but it didn’t quite have the same cachet as Indian Wells – she defeated Marion Bartoli in the final and an injured (left knee) Serena Williams 6-2, 3-1 ret. in the semi-finals. Andreescu was a brazenly ambitious shot-maker – whether it was laser ball-striking from the baseline, crafty drop-shots, bold swing volleys or big serves – throughout the tournament. “It basically is nothing can distract me,” she said about her mindset. “I’m relaxed. I trust myself. I trust my shots. I feel confident. In those moments, I try to breathe as much as I can, as well, to get into the zone. That’s what I do usually before the match. 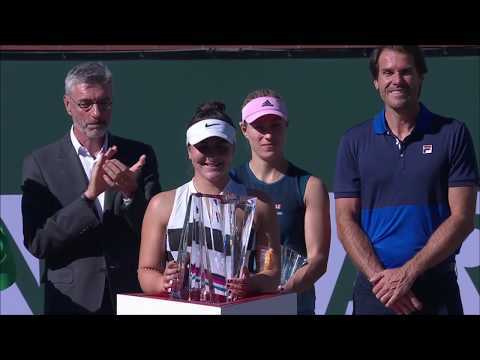 The enormity of Andreescu’s win – she’s the youngest Indian Wells winner since a 17-year-old Serena Williams in 1999 and the only wild card to capture the title – and her incredible progress over such a short time was overwhelming. “I was actually really dizzy in the locker room because just there were so many thoughts and emotions going through my body,” she said. “I had a good ice bath, which I think calmed me down a bit. Andreescu is in the draw for this week’s Miami Open – and quite a draw it is for her. In the first round she plays Irina-Camelia Begu, the No. 70-ranked Romanian she defeated 6-7(3), 6-3, 6-3 in the first round in Indian Wells and then, if she advances, No. 32 seed Sofia Kenin, the last player to beat her – 6-4, 3-6, 7-5 in the semi-finals in Acapulco the week prior to Indian Wells. If that isn’t enough, she could have a re-match with Kerber in the third round if, after a bye, the 31-year-old German can beat a qualifier. There would have to be some thought given to skipping Miami. Andreescu would play either Tuesday or Wednesday in the first round. Factors such as the exhausting, life-changing experience that she has been through, and her fitness related to a wrapped right shoulder that she said was “really tight,” would have to be taken into consideration. Right from the beginning of this year’s BNP Paribas Open, Andreescu has been a bright, playful presence in the media interview room. That continued Sunday. During the presentation ceremony, Andreescu didn’t forget to say her thank-yous after acknowledging Kerber and tournament organizers and sponsors. “Also to my team, thank you for being there for me throughout so many years,” she said. “It really means so much to share this moment with you right now. Also to my parents at home – actually they’re in Miami right now – for being there for me, for sacrificing so much for me to pursue my dream. I love you guys so much. Over the 12 days she was playing in the tournament, Indian Wells Tennis Garden patrons whole-heartedly warmed to Andreescu – finding her rambunctious game-style and infectious personality hard to resist. As well as 1,000 ranking points for winning the Premier Mandatory event, Andreescu received a winner’s cheque of $1,354,010 (US) to add to her previous career earnings of $350,909. The landscaping at the BNP Paribas Open is meticulous, though the picture here is not the very best example. But it’s near the entrance where the players arrive, and a nice effort to make something of what otherwise would just be a big boring beige-coloured wall.